If the ageless song and dance man Tommy Tune seems to have one foot off the ground and his head in the clouds, one reason is that he stands tall (“5 feet 17¾ inches,” by his count) and can literally see over most people’s heads. At Tuesday’s opening night performance of his show “Tommy Tune, Tonight!” at the Café Carlyle, he was the suave, ebullient charmer we all know and treasure. Over the decades, this ingenuous grown-up boy from Texas has also acquired the glitter-crusted shell of a show business trouper like his “spiritual godmother,” Carol Channing. The Café Carlyle, with its tiny stage, is not the ideal club for an entertainer like Mr. Tune, whose stride on this night was almost as broad as the space he occupied, but he cheerfully made the best of it over an evening that covered much theater history and included a lot of tap-dancing. Mr. Tune’s voice is modest by the stentorian requirements of Broadway. He is really a dancer who sings just well enough to convey the enjoyment of being an airborne star, and at 76, he is remarkably lithe. When he moves, he still glides. As an artistic statement, “Tommy Tune, Tonight!” is a lighthearted essay in syncopation that calls attention to the relationship between patterns of drumbeats and the sound of tap shoes. Accompanying Mr. Tune was a trio led by his longtime musical director, Michael Biagi, on piano, with John Myers on drums and Marc Schmied on bass. Mr. Coles gave Mr. Tune one of the best pieces of advice one dancer could give another: “Be more nonchalant.” And Mr. Tune demonstrated how that translated into tap-dancing. His song choices —“Raindrops Keep Falling on My Head,” “Nice ’n’ Easy,” “Fascinating Rhythm” — reflected a star determined to stay aloft and to bring us with him to his place on Cloud Nine. 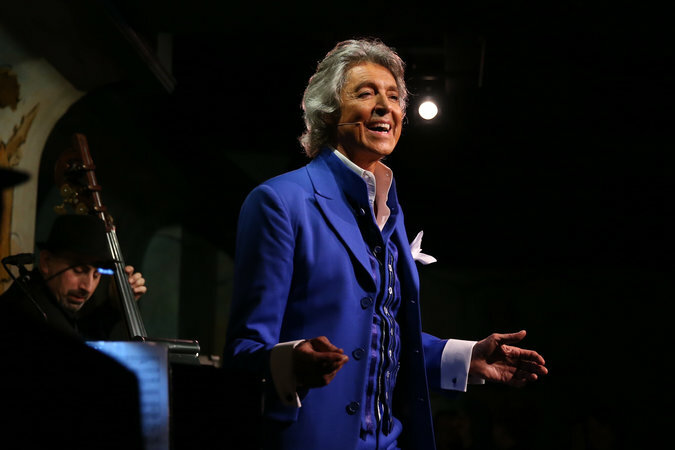 Tommy Tune continues through next Friday at the Café Carlyle, 35 East 76th Street, Manhattan; 212-744-1600, thecafecarlyle­.com.